Cathy's Card Spot: Embossed metal feathers. Hi everyone, I've been playing with some metal sheet that I've had for ages. It isn't adhesive and can be tricky getting glue to take but it was great for these feathers as the glossy accents sat along the ridge at the back of the feather and adhered perfectly. The challenge at Paper Artsy is metallics. There are so many gorgeous pics and design team projects for inspiration. I especially loved the metal flower created in the tutorial by Lin Brown. I stamped a feather image on the metal with Stazon ink then diecut it. Here's a pic of how they started out. The ink was really just to add a layer of colour so perfect cuts didn't matter. I used my paper flower tool for veining leaves and mat to emboss the details on the feathers. A tiny ball tool was used to make dot impressions too. (Hard to see in the photo but you can see them on the real thing). Next I added some colour by dabbing on some ground espresso distress paint then after 30 seconds or so rubbed some of it off. The final colours were alcohol inks in stream, stonewashed and denim. I painted on a thin layer of modge podge dimensional magic to seal the alcohol ink. This challenge was so much fun that I've ordered some tools so I can try some of Lin's flowers! Stampin Up feathers stamp & die and petal burst embossing folder; black Stazon ink; ground espresso distress paint; stream, stonewashed and denim alcohol inks; Modge Podge dimensional magic; Stamplorations Trendy Feathers 2 sentiment stamp; versafine ink. Oh, these feathers are really gorgeous. 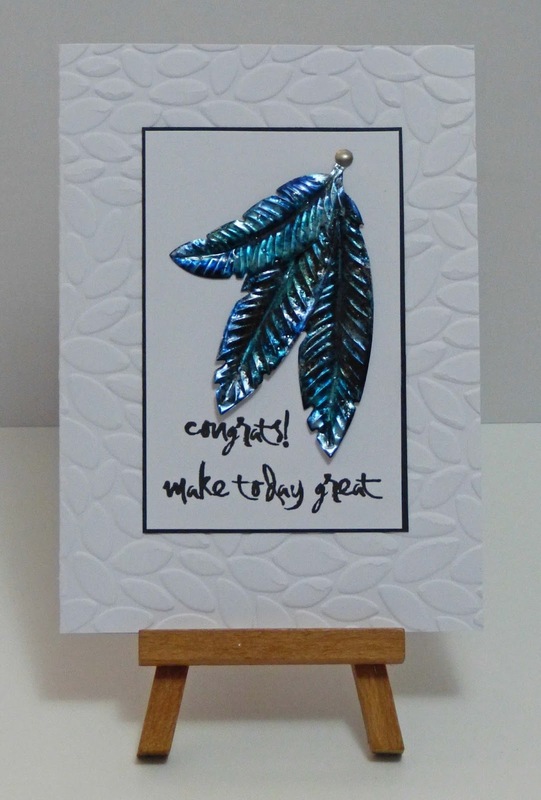 A fabulous card - I love the embossed feathers. Stunning!! I love the embossed feathers Cathy! I love that you used that petal burst in the background such a fabulous design.